The best four months of my life. * Her favorite thing is to hear you sing "I'm fine, how about you? I'm fine. How about you?" over and over. It's guaranteed a smile, every single time. * Her favorite CD is by Kimya Dawson. Again, instant smiles and laughs. * she loves to play with toys and rattles now. * she talks constantly and we LOVE that. * she thinks she's two and wants to be in a sitting or standing position all of the time. * she loves to scream and then laugh at herself. * her laugh has turned into a little girl giggle now and it is too precious. * Her 4 month check up isn't until next week (adam scheduled it so he could be there) so Im not sure her exact measurements yet but she is getting SO big. She looks like a little woman next to Jack. * she is truly the BEST thing that has ever happened to us and we could NOT be happier. 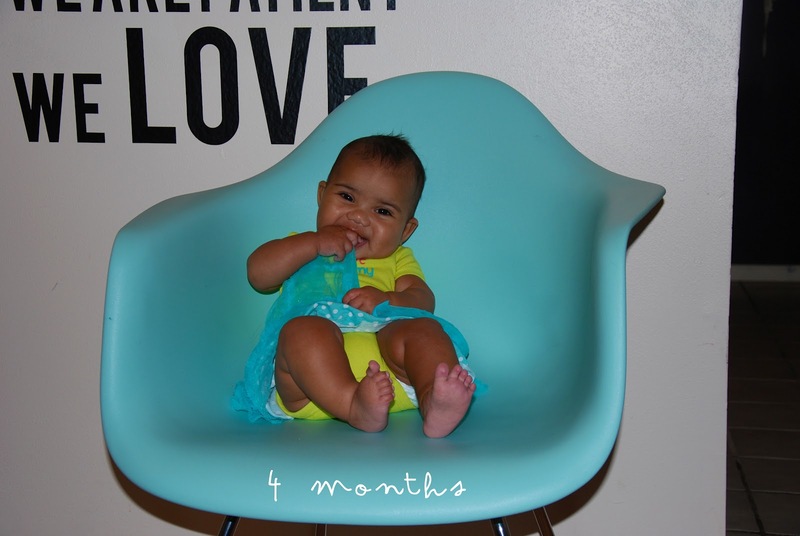 Happy 4months, she looks so happy and pretty!! I love all the little things you wrote about her, so wish I had done that when mine were little. You really do forget these things so keep writing them down, it will be fun to look back on. Love the 4th of July photos, can't believe she sat thru all that noise, they are beautiful pictures. Her little headband is too cute!! That is so cool and I bet Shelby loves the fact that you took so much time to do all of that :) Also, we totally had a BAG phone! !